Narrative: At 7:41 a.m seven companies of Tacoma Firefighters (four engines, one ladder, one medic company, and command staff) responded to a reported residential structure fire. First arriving companies found heavy smoke and flames showing from the upper floor of the 1 1/2 story 2,386 square foot bungalow. Crews mounted an aggressive interior attack with hand lines, vertically ventilated the building to release heat and smoke from the attic area and conducted primary search and rescue. Working smoke alarms alerted the occupants to the fire and all escaped without injury. UPDATE: The cause of the fire was an overheated lamp, resulting in an estimated $30,000 damage to the building and its contents. 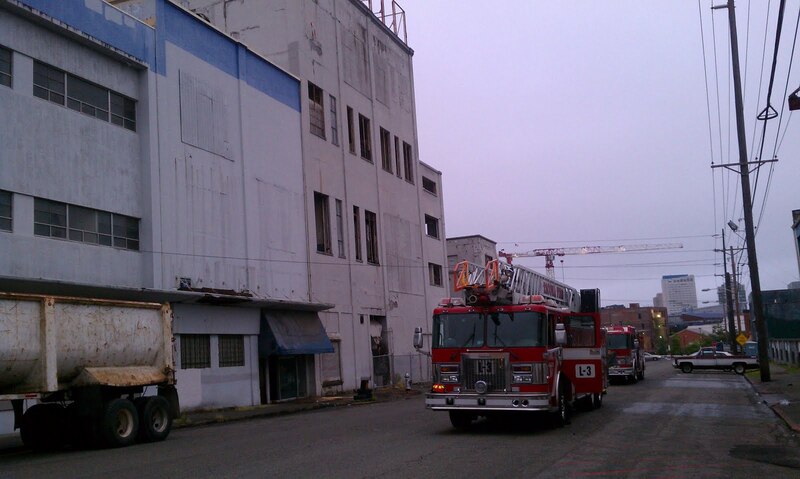 Narrative: At 11:48 p.m. nine companies of Tacoma Firefighters (5 Engines, 2 Ladders, 2 Medic Companies and command staff) responded to a reported roof fire in a commercial building. First arriving companies found a well established fire on the roof and upper floor area of a portion of the Columbia-Heidelberg brewery complex. The fire was upgraded to a second alarm at 12:22 a.m. (3 additional engines and 2 ladders) - securing more resources to prevent the fire from spreading to the adjacent buildings. Fire crews also made considerable salvage efforts to help preserve the inventory of the Pierce County Toys for Tots program being stored in the warehouse building exposed to the fire. UPDATE: Fire investigators have concluded that the area of origin of the fire was in a room on the top floor of the building, but are undetermined as to it's cause. There are no obvious signs that the fire was deliberately set or is suspicious in nature.